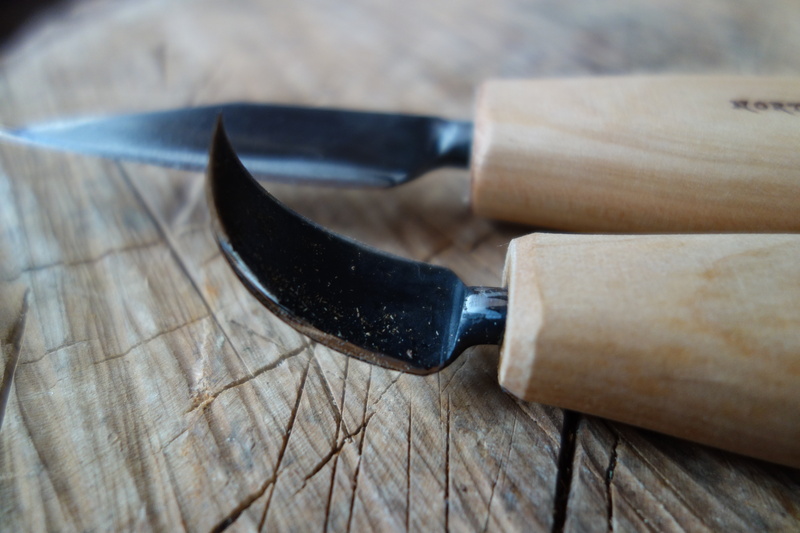 When I was a student at Goddard College in the later 1990’s, a friend and fellow student somewhat reluctantly let me borrow his amazing bent-blade carving knife for a weekend. He picked it up from working with his neighboring San Juan Islander, Jim Wester of North Bay Forge. The blade, sharp on both edges, was of a similar design as those used by indigenous people of the pacific northwest. Sheathed by a section of garden hose, I packed it off to Cape Cod on a weekend trip. I picked up a piece of Dogwood and crafted my first spoon, a chunky handled ice cream scoop with a 1″ knot in the handle. That was when I fell in love with making spoons. I first purchased my own double-bladed Deep Bent Knife and general purpose Straight Knife from North Bay Forge in 1997. 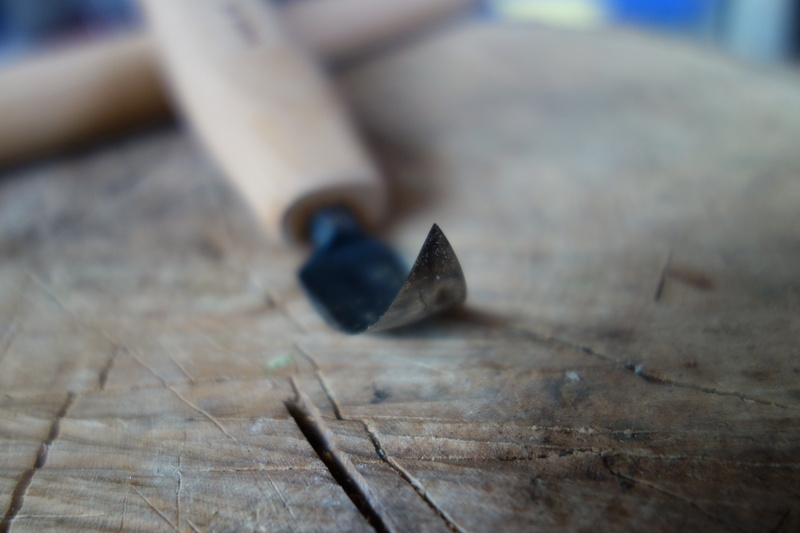 Over the years I have accumulated other tools from Jim’s shop, including a scorp and an adze, but the Bent Knife is the tool in hand for most of what I do, which is carve green New England hardwoods into kitchen spoons and spatulas. My original old Deep Bent Knife and Straight Knife (not shown) arrived razor-sharp, and after 17 years, they have changed little. Still razor-sharp, and I’ve done little to keep them that way. I carve green wood, so it is easy on the blades. I keep them away from rocks and steel and children. I rarely, lightly, sharpen them. Over the years, I have kept a few extra knives on hand for workshops (and maybe out of a bit of tool hoarding behavior), but eventually passed those on to others. Recently my 11-year-old daughter has been getting interested in spoon making, so I made another purchase from North Bay Forge. A few days after ordering, the knives arrived USPS neatly packaged in a mailing tube. Because my purchase was over $100, the shipping cost was included. The blades are oiled and dipped into a thick rubbery plastic coating, and the knives are wrapped in corrugated paper, including a handout with information about use and sharpening. 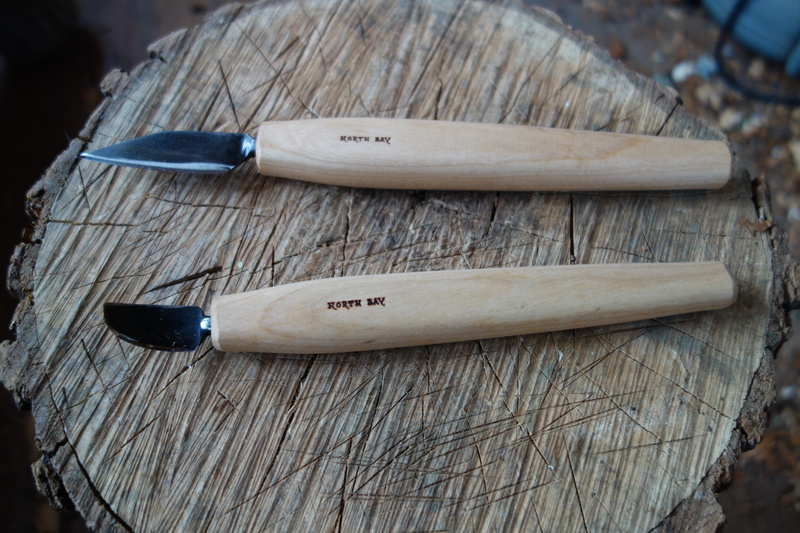 The Eastern Cherry handles on the new knives are untreated, awaiting the oils from a carver’s hands to develop a patina. A couple of differences that I noticed in the new Deep Bent Knife. The overall length of the blade out away from the end of the handle is slightly, but noticeably shorter than my original 17-year-old knife. The new knife blade is also somewhat wider (edge to edge) than the original knife near the base of the knife where the tang enters the handle, and from a certain view looks more “triangular”. Finally, the convex side of the blade shows no peening marks like my original knife. 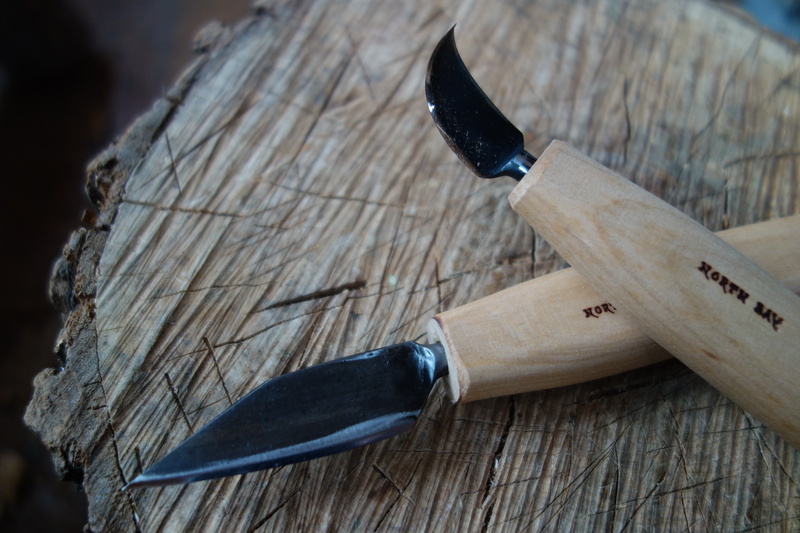 Both knives are as sharp as can be and ready for use after pressing the blade against a block of wood, removing the protective rubber coating, and wiping off the oil. I chose the Large Straight Knife this time, and the blade is about 2 1/4″; about twice the size of my original knife. On the Straight Knife, somewhere over the years Jim dropped the curved back of the knife sloping down to the point, and opted for a beveled back, which is on all 3 sizes of Straight Knives. This knife is huge and akin to a stiff razor blade at the end of a handle. One false move and…be careful! It takes some time to develop the technique to use the bent knife safely and take full advantage of the many angles and thumb-fulcrum from which you can carve. 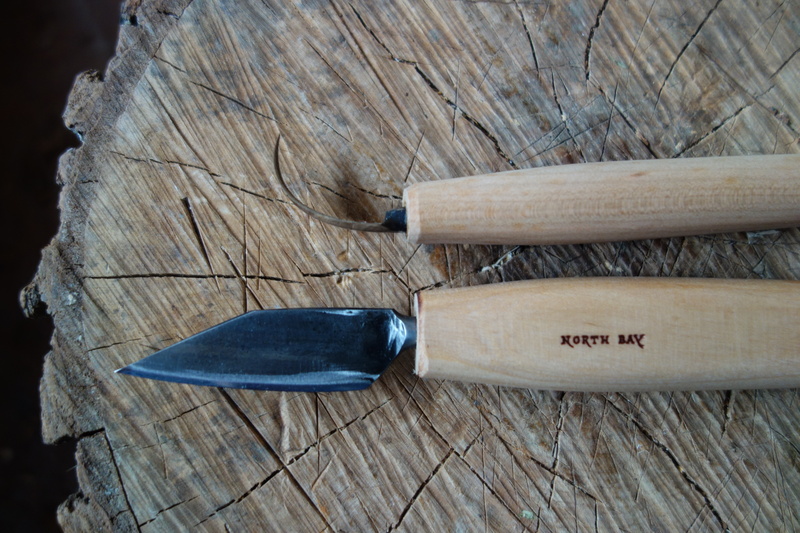 But once you get the hang of it, these knives make quick work of hollowing large spoons and bowls, cutting across stubborn grain, and leaving a finished surface behind. I have never looked elsewhere for carving tools. The craftsmanship and quality of Jim Wester’s hand-forged tools honestly makes them worth every hard-earned penny. His website is full of information about the process of forging these knives and how he came to start his business. I highly recommend these tools and reiterate my warning that they are SHARP!